So yesterday - I got a dreaded call. I failed my glucose test. I realize there are MILLION things worse in life but I was very sad. So instead of doing Christmas shopping today while Harper was at MDO - I spent the whole day at my doctor's office doing the awful 3 hour test. (Which really by the time I checked in and drove there and back was more like 4 hours). In case you don't know about this - basically they drew blood when I got there and then I drank a sugary drink and then every hour for 3 hours - they would draw my blood again. In the mean time I got to just sit around and wait. Thank goodness I ran into two different friends in the waiting room who kept me company! And you can't eat from 10 the night before until you are done so when I left I hadn't eaten in 15 hours and I had given a lot of blood. I decided I wanted a juicy hamburger at this really great place in town. I was going to run in and get it to go until I got in there and realized I was about to pass out. This is me waiting on my food and trying very hard not to fall on the floor. And Hallelujah - this is the thing that saved me! I can't tell you how good that Burger tasted. And I felt like everyone in there was probably looking at me because I sat in a corner alone hunched over my burger INHALING it. I was so shaky I couldn't get it down fast enough. But I felt much better after that. Wouldn't you? So I won't know for about a week if I have diabetes. I'm a little nervous since my dad is diabetic and since Harper was so big. My main worry is often people with GD have big babies and since H was almost 10 lbs and they are already concerned Hollis will be bigger - heaven help me if I have to deliver a 12 or 13 lb baby. I just want Hollis to be healthy. So if I have to give up cake balls and eat lettuce for the next thee months - I'm on it! 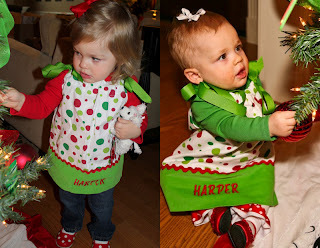 Harper looked so cute this morning - I tried to chase her down and get a few pictures. Never an easy task. We pulled the "wearing last years dress as a shirt this year" trick again today. I loved looking at these pictures of her last year and this year. It's crazy to me how much she has grown. Angie Smith made her this dress. Not just a talented writer but she sews too. Not fair! If comes out with an album singing - let's all boycott her! ha! I also just wanted to let you know you have one more chance to win a $100 gift card from Olay and Blogher!!! Just go here and leave me a comment!